It is Maundy Thursday–the day before Good Friday (when the Last Supper took place in the Passion of Christ). To celebrate, I have drawn a picture in the little moleskine sketchbook which I carry with me during my workday). Based on some comments and feedback, it is not completely clear that everybody sees the plight of my allegorical flounder in the desired light. Perhaps this tiny spiritual drawing will clarify the symbolic meaning somewhat. Jesus was a fisherman too…as were the first four disciples–that is why his first symbol was a fish. Anyway, Happy Easter! We will be back tomorrow with the annual Good Friday post! Happy April Fish Day! The French manifestation of April Fool’s is much nicer than the rather horrid Anglo-Saxon version. There is still room for farcical fun, as friends try to affix colorful paper fish to each other’s backs (although, admittedly, wearing a pretty fish is no substitute for being badly frightened or lightly injured in an American prank). Anyway, I was thinking about these fish, and it gave me an idea for camouflaged sculptures that blend in with the surroundings. One of the secret strengths of the flatfish (which have become an artistic fixation of mine lately) is that they are capable of changing color to blend in with their habitat. Unfortunately, this is usually a muddy seabed, which never really allows turbot, sole, plaice, and such like flatfish to explore their frivolous fashion side. With this in mind I set about building a flounder mold to make some “crouching turbot…hidden flounder” sculptures. Unfortunately I only managed to craft a handful of prototypes, and I was unable to position them to maximum photographic advantage in the concrete jungles of early Anthropocene Brooklyn (yet). However we can get to that later. Check out these streetfish I made for April Fish Day! I couldn’t find anything made of shiny steel to put that last one on top of, but fortunately my friend and erstwhile roommate Jennifer was wearing some fashionable silver footwear to help the poor fish feel at home! This is just the beginning of this project and we’ll see some more exotic streetflounder in the near future (as soon as I find some more disposable containers for mixing plaster) but in the meantime, happy April Fish Day! Let us revel in the beauty of spring! Additionally, this is the ninth anniversary of the founding of Ferrebeekeeper, an event steeped in mysterious lore. Celebrate the happy occasion by dropping me a line or telling me what you would like to see more of! I, personally would like more comments, and, to that end, I promise I will be better about responding quickly and cogently. Thanks again for everything. My readers are the best! Imagine a colony of little shrimp frolicking on the bottom of the ocean when suddenly the earth opens up its mouth and swallows one of the shrimp: the sandy substrate was actually a lurking flatfish hunting for dinner. In the shadowy depths even bigger predators are in turn hunting the flounder. Glistening hooks with sparkling bait descend from unknown realms above. The Great Flounder is a symbolic avatar of the worldwide ecosystem–a seemingly adversarial realm of constant cutthroat competition. Yet closer study of ecology reveals that living things are far more dependent on each other than the predator/prey relationship makes it seem. If a flounder eats a shrimp, the world moves on. If all of the shrimp vanish, or if all of the flounder are fished out of the ocean, other dominoes begin to fall and the whole web of life starts to dwindle and fold inwards. This brings us to humankind, a worldwide collective of cunning primate colonies which are in ferocious violent competition with each other. If there were ever an aymmetrical animal, t’is surely us. Our history and our science have given us a unique place in the world ecosphere–but we are not dealing well with our new prominence. This piscine artwork reflects our past and our present. In the flounder’s tragicomic eyes we can perhaps glimpse our future of glory, grandeur, and doom. Or who could suffer being here below? Had he thy reason, would he skip and play? And licks the hand just rais’d to shed his blood. I keep thinking about the great steppes of Central Asia and the magnificent scary hordes which would pour out of the grasslands into Western civilization. Because I am more familiar with Greco-Roman history and the history of Late Antiquity, I tend to conceptualize these nomads as Scyths, Huns, Avars, the magnificently named Khanate of the Golden Horde, Bulgars, or, above all the Mongols (to name a few). Yet all the way on the other side of Asia the great steppe ran up against the civilization of China. On the Eastern edge of the steppe the great Empires of China had a whole different set of nomadic hordes to contend with: Donghu, Yuezhi, Sogdians, Hepthalites, and, uh, above all the Mongols (to name a few). If you read a macro history of China, these guys continuously crash in from the western wastelands and mess everything up on a clockwork basis like giant ants at a picnic that spans the millenia. Isn’t history something? One of the greatest Nomadic confederations of the East was the confederation of the Xiongnu which stretched through Siberia, Inner and Outer Mongolia, Gansu and Xinjiang during the era of the warring states and then the Han dynasty (from around the 3rd century BC to the late 1st Century AD). These tribes had complex relationships with the civilization of China, sometimes bitterly warring with the Empire and other times allied to the Han and intermarrying with everyone from the emperor’s family on downwards. That’s an artist’s recreation of them right above this paragraph. They certainly look very splendid and prepossessing in the illustration, but the truth is we know very little about them. Scholars are still debating whether they were Huns, Iranians, Turkik, Proto-Mongols, Yeniseians, or what. My guess is that they were a lot of things depending on the time and place. Historians (and politicians!) get too bogged down by chasing ethnic identities. But the fact remains that we don’t really know their language or culture…even though they had a long tangled 500 year history with a culture that loves to write everything down and keep it around forever. All of which is a long macro-introduction to a beautiful historical artifact from 2200 years ago. Here is the golden crown of a Xiongnu chanyu (tribe/clan leader) which was smithed sometime during the late Warring States Period (475-221 BC). It features a golden hawk on top of an ornate golden skullcap. The central elements are encompassed by a braided golden coil with different grassland beasts interspersed. I would love to tell you all about it…but, like so many other artworks, it must speak for itself. It does seem to betray more than a whiff of the transcendent shamanistic culture which is still such a part of the Siberia, Mongolia, and the Taiga (if you go back far enough, this animal-themed animism informs much of the early civilization of China itself). It is certainly extremely splendid. I could look at it for a long time. One of modern age’s great obsessions is the desire for simplicity. You see this concept everywhere—lifestyle gurus sell millions of books about simplifying your life. Hollywood blockbusters are about salt-of-the-earth country boys with a monosyllabic moral code who become action heroes and easily defeat the bad guys. TED talks distill data science into a short anecdote from primary school. The infatuation for simplicity is omnipresent—in fad diets, in investment strategies, in household management, above all else, in politics (boy howdy is the desire to make things simple running rampant in politics!). This is a shame: for simplicity is a fallacy. Things are not simple at all. Generally, the more one studies a field, the more one realizes how complicated, nuanced, self-contradictory, and messy that field is. A lead ball and a feather fall at the same rate…except in the real world where they fall so differently that thermodynamics and gravity are hidden. History is not one all-important person [Napoleon or Alexander the Great, for example] saying “I will accomplish X”: it is countless millions upon millions of people trying to accomplish innumerable conflicting goals in opposition to each other (all while churches, nation states, guilds, secret societies, kingpriests, banks, and other strange cabals work on their own conflicting agendas). In college I was excited to take cell biology and learn about the simple building blocks that life is made of…until the professor came in and wrote the Krebs cycle on the board as the first thing. That was the first ten minutes! The rest of the class was learning how wrong the “simple” elegant metabolism cycle (below) can go when you start adding new chemicals. Simplicity is not real except as a concept. And it is a dangerous concept! The purpose of today’s post is not to teach you the Krebs cycle (as if I could) or to encompass all of history. Instead we are pushing back at simplicity by striking at minimalism–the art form which espouses reductive simplicity. Why am I attacking minimalism instead of other confidence tricks based around the illusion of simplicity? Art is the wellspring that ideas come from. Concepts that bubble up in a font on Mount Parnassus are sanctified by the muses (or I guess these days by Jerry Saltz) and then trickle into other fields. To start to make some headway in this worldwide morass we are in, we need to let go of some of these illusions about simple being better. To start with that we need to go back to minimalism’s aesthetic roots in modern art. The reason art is so germinal is because it is a place of illusions and magic. The most fantastic imaginings can be real there. Do you not like to walk? You can paint everyone as flying! Are you sad that most of the creatures that ever existed have gone extinct? Just draw them as living together in Super Eden! Do you chafe at the Byzantine organic chemistry level complexity of, well, everything…just draw it as ridiculously simple! And artists have certainly simplified. There are many artists who became influential just painting white canvases: Malevich, Martin, Baer, Albers, Ryman…the list goes on and on. Arguably some of these works were made to express the same concepts I am expressing here. Simplicity is not simple. That infamous white canvas “Bridge” by Robert Ryman (1982, pictured below) has probably engendered more complex philosophical art essays than just about any artwork from the seventies/eighties. Looking at a pure white canvas makes you realize that white can be warm or it can be cold. White can have a variety of textures and microdetails…to say nothing of the dense world of allusions it opens up. Thinking about the nature of white begins to raise troubling questions about cognition, physics, and the psychology behind how we see things. But sadly these meanings have not translated well as Minimalism the art movement has flowed into minimalism the cultural phenomena (frankly I think the minimalism wing in the art museums might be a bit of a carnival trick too, to get people laughing and talking not to impress them with the sublime). The minimalist aesthetic has been a growing problem in America for decades. Any New Yorker will instantly recognize the prestige look of the present moment—off-white walls, ugly blocky furniture made of blonde wood and neutral fabric, recess lighting, lots of glass & steel, monochromatic accents, and minimalist artwork. To obtain the image at the top of this paragraph, I went to Google and image searched “beautiful apartment” and the results were hundreds of images of identical white rooms with what seems like the same furniture set. It is like being trapped inside a display refrigerator at Sears (does that place still exist?). Is this beautiful? Obviously not, but it is cheap and simple for developers to craft. I feel like these rooms are like the GUI of a computer—they are seemingly simple, but they are really designed by vast corporate interests to sell things (and also there are vast worlds of complexity, disorder, and mess crammed into storage, just out of sight). Minimalism look good on screens—it is simple enough to be comprehensible even in a thumbnail so you can sell it online (no need for photoshopping). Also minimalism is like a carnival barker’s trick or an infomercial pitch in another way too. Its simplicity makes it easy to sell. And here is where we get to the real heart of minimalism. It is commercially successful. That Ryman painting a few paragraphs back sold in 2015 for $20.6 million! We already know how well Kondo’s works about decluttering your life sell. The “clean” diet kills people because it lacks sufficient nutrients for human beings, but people adhere to it with religious fervor even when MDs beg them not to. Our world is so complicated and baffling that the allure of simplicity is an enticement beyond any other. Yet it is salesman’s con job. Don’t let people convince you that white paintings have a meaning that supersedes all other art or that empty rooms are best. Simple solutions in politics tend to be impossible and dangerous. Simple diets will kill you. I wish I had said my thesis more simply, rather than writing such a winding narrative to say such a straightforward thing. Anything of beguiling simplicity is almost certainly a lie. I am looking forward to writing the second half of my post about minimalism (which I promised in my angry Marie Kondo post), but first, let’s take some time out to celebrate National Polka Dot Day–which is (evidently) observed on January 22nd. I love polka dots for footwear and neckwear (and I seem to recall a special childhood blanket with beautiful kelly green polka dots on it), but, as we already know, polka dots are not merely for decorative use. Dots occur again and again in nature, where they are critical for mimicry, display, and camouflage. Likewise, art returns again and again to the dot, not merely as a design motif, but as a formative abstract building block. Certain artists did not merely utilize polka dots in their works–they utilized nothing but polka dots, which became the entire focus of illustrious art careers. Here are three polka dot theme paintings to mark the holiday. Let me know if you have other favorite works. First, at the top of the post is one of Yayoi Kusama’s pumpkin works (Yayoi Kusama, Pumpkin (2000), Acrylic on canvas, 53.3 x 65.4 cm). Kusama is the undisputed doyenne of polka dots in this age…and perhaps in all other eras as well. Focusing on the dots has kept her sane and brought her unprecedented international fame. Yet beyond the hype and the relentless obsession, there is a relentless exploration of visual phenomena and ultimately of ontology within Kusama’s artworks. All things can be reduced to dots…or perhaps to atoms (which are after all another even more abstruse sort of dot). Yet, even if it Is made of circles, still the pumpkin exists. And there is an enormous formal beauty in its mysterious gestalt. Roy Lichtenstein is also famous for making works out of polka dots. His work is less metaphysical in its subject than Kusama’s, but instead addresses the extent to which humans recognize and respond to iconography. The above painting, (detail below), takes a panel from a serial-style cartoon strip and blows it to enormous size. Although the work is instantly familiar from countless anonymous Sunday newspaper strips, it is alien too. The anxious woman is as strange and inhuman as a Byzantine mosaic (and she is likewise made of innumerable tiny unrecognizable pieces). Yet because of a lifetime of habituation she is instantly familiar, as is her melodramatic situation (even if we lack the particulars). I completely ran out of time today, so here is a picture of a sculpture which I made at the end of last year. It is a Romanesque Flounder with strange Babylonian parasites embedded in the various arched niches. 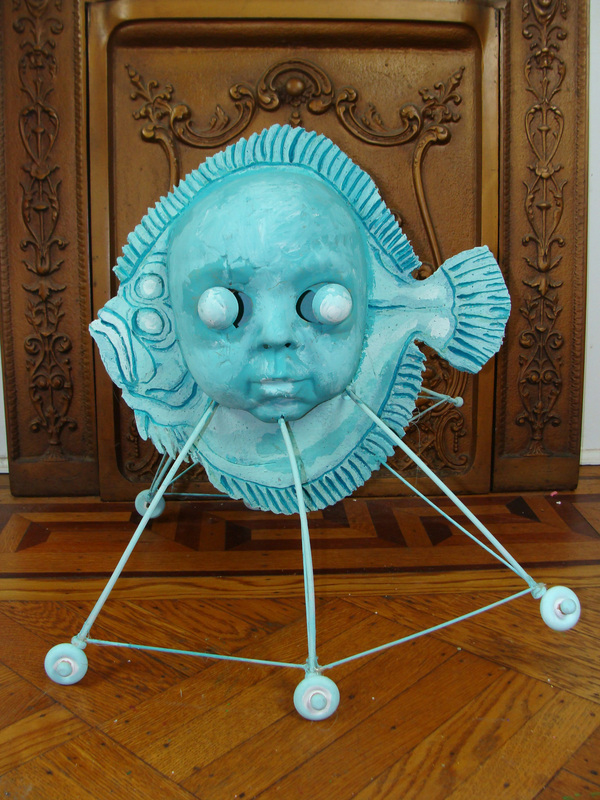 The fish is made of wood and the smaller sculptures within are sculpted of sculpey polymer. As you can see, my “studio assistant” Sumi Cat is reviewing it carefully to see if there is anything which needs to be altered by being clawed off and knocked into a forgotten corner. It is a bit harder to say what this sculpture represents, but the flatfish is my avatar of Earth life (and a sometimes a sort of psychopomp/spirit guide sent by the dark gods below). The dark tree is a cruel parody of the tree of life and the parasites are clearly beings of pure appetite (albeit with a certain ecclesiastic flair). This must be a sculpture about the appetites which religion is meant to satisfy…but what the nature of those appetites is and how we can avoid being controlled by them is a question which resists facile answers. Best wishes for a Merry Christmas. As a once-and-future toymaker, I got pulled into some Christmas projects and didn’t write as many year-end blog-posts as I wanted. Yet there is an upside: you get to see the projects I made! (in the future, I need to be better about featuring such stories in a compelling way online). Anyway, all of this is to say that here is the skateboard deck I made as a gift for my friend. My friend studied classics in school, but then became a computer programmer. The word at the right says “the charioteer” because the charioteer was Plato’s metaphor for the human psyche. The charioteer is swiftly driving forward in a world of mortal peril. He has two horses pulling him–a bright white horse and a dark unruly horse. Often times they strain to rush in different directions and the charioteer is hard pressed to travel the desired direction. His chariot could come apart at any moment…but he is swift and powerful. The charioteer is driving on top of a flounder (for that is my own metaphor for the interconnected world of all Earth life). 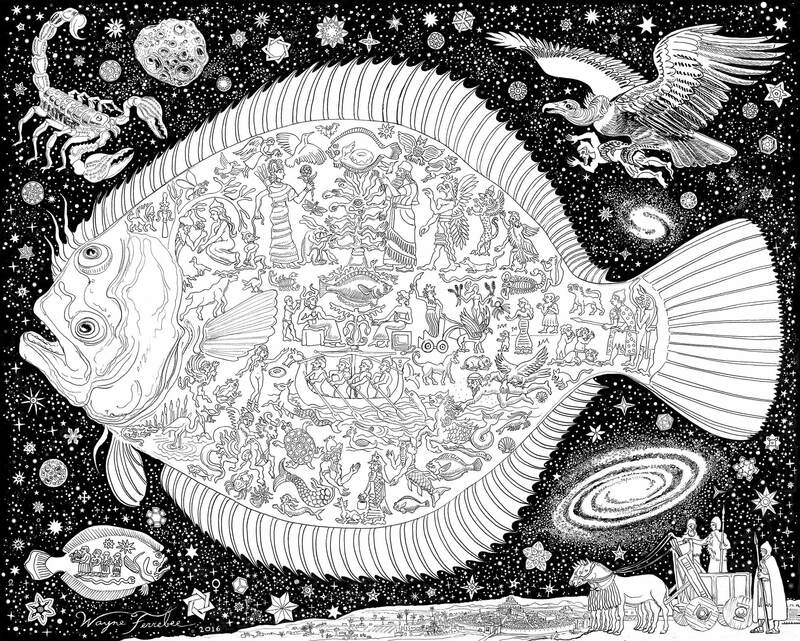 In this instance the flounder is made of ones and zeros…since my friend did the programming for my online oracular flounder (if you want to give me a Christmas present, ask the fish questions and write your honest impressions below for we are making some changes in the new year!). Not only is the flounder made of ones and zeros…the ocean itself is too. In this new world, if you want to drive your chariot to creative success, the only way is to drive through a virtual realm! We are working on it…and so are you, why, I venture to guess you are looking at online content right this very moment. Maybe you should go enjoy some Christmas cheer in the real world…just as soon as you look at my damn flounder and make a comment below.